The Usersnap search together with the personal lists of the project dashboard has enabled our customers to do some incredible things with Usersnap. The way the Usersnap search and the personal lists have been used over the last months is just wow. Especially with the label feature of tagging and labelling bug reports and screenshots, the personal lists got super personal. Have you ever tried the Gmail search? Yes, you did? Well, then you probably know how annoying it is creating and searching with different labels. Because of that we thought about an easy and user-friendly way of searching for labels (or you can also call them tags). With the new label manager you can organize all your labels in one place. You can create new labels, delete existing ones. And you can even adjust the label color with the new label manager. The label manager can now be accessed in the project settings of every Usersnap project. In the new tab “organize” you can customise, delete and modify all existing labels, as well as you can add new labels to your project. If you haven’t noticed this feature before, here’s a little explanation of how to create a new label. It’s super easy. Basically, there are two ways for creating new labels. 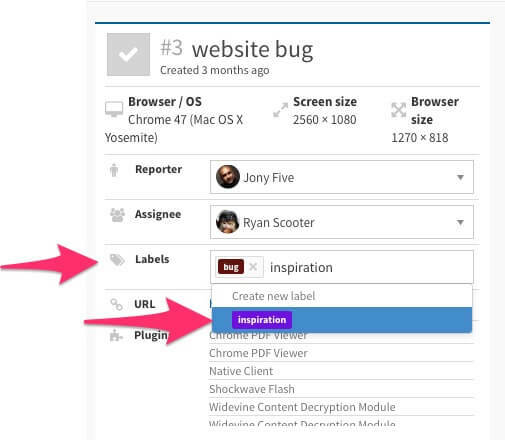 1) You can create a new label simply by entering the label name on any particular screenshot or bug report. or 2) you can create a new label in the new label manager in the project settings. Why making use of labels? People use labels in different kind of ways. The most obvious use case for using labels is the dashboard search. Labelling your bug reports and screenshots with “bug“, “idea” and “improvement” enables you to search and find tickets which are relevant to you. Another important use case for labels are the personal lists. You can create and modify your project view to your personal lists by filtering your tickets. For example, you can create a new list only displaying tickets with the label “bug“. This enables you to display tickets along certain criteria (such as labels). You can learn more about personal lists and how to use labels for personal lists in this blog post. Let us know what you think about labelling bug reports and the new label manager in the comment section below!